Fitness challenges are becoming popular at Bar Method studios around the country because the workout makes such noticeable changes in students’ bodies. The challenges are contests held over three to four months for various prizes. Recently, the Bar Method studio in Redmond just East of Seattle, Washington held a Fitness Challenge that inspired many students to work a little harder than usual. The testimonials that the contestants wrote are inspirational, and I found them fun to read. Bar Method Redmond has been open less than a year. In early 2009, two Bay Area Bar Method teachers moved back home to the Seattle, Washington area to open their own studio near where they grew up. Bev Currier had been teaching in Walnut Creek, California for years. Maika Manring was a newer teacher in that same studio. 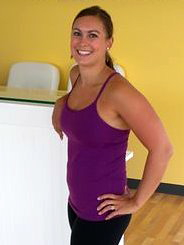 The two women were joined by Bev’s husband Luke Currier, who although not a teacher, is integrally involved in every other aspect of the studio. Here is one of the stories that I particularly love from Cynthia and her before and after pictures. “I joined the fitness challenge with the goal of attending Bar 5 times per week. In reality I made it on average 3-4 times. My overall goals consisted of getting in shape for a looming 10-year high school reunion this summer and fitting into a pair of jeans I have hung on to for way too long! I was so excited to join this challenge and see it through just as quickly as I had committed to it. Over the course of the challenge I overcame many obstacles along my fitness journey to achieve success: sprained ankle, sickness, family illness the loss of my beloved grandpa. Through each of these obstacles I rededicated myself to my goals by making positive life long changes. I did this by focusing on balancing my diet and eating habits, especially when it was not possible to attend Bar. These obstacles also gave me a better understanding that eating healthy in addition to Bar Method workouts was also a key component to achieving the results I set out for myself. Each obstacle I overcame allowed me to achieve small successes every week and every month I participated in the challenge. My overall method for reaching my goals was to attain them by balanced, realistic and sustainable means. In short, my recipe for success has been largely based on attending Bar Method classes regularly, drinking more water, getting more sleep, limited alcohol consumption, less soda, less overall calorie intake and generally paying greater attention to what I am putting into my body. The more classes I attended, the more I came to the conclusion that I love Bar Method! There has not been a single day that I did not experience the sensations of burning, shaking and quivering in nearly every muscle in my body. The combination of pilates, yoga with isometric movements has been the best compliment to my typically cardio-heavy workout regimen. I have never had the muscle definition and dense muscle composition that I have now. My battle with weight has been a recent struggle of mine. It was not until I entered my late 20’s that I ever had any difficulty managing my weight and staying toned. Bar Method has not on transformed my body but also the way I approach my ongoing fitness goals. Now at 28, I’m committed and dedicated to maintaining a healthy lifestyle, which includes Bar Method regularly! Along this journey I have gained confidence, my clothes fit better (I now fit into that pair of jeans I have hung on to!!! ), I stand taller and I have more energy and motivation. After 4 months I have lost: 1.5 inches off my arms, 2 inches off my chest, 3.5 inches off my waist, 3 inches off my hips, 3 inches off my thighs, and 1.25 inches off my calves! Sometimes it has felt like life interrupted my fitness plans on my fitness journey but like everything else in life some things do not go as planned, we take a detour along the way, but amazingly we can still arrive at our destination. I have felt this many times over during the course of this challenge. I am definitely a stronger individual because of these experiences and obstacles. Even though I was able to meet most of my fitness goals for this challenge I plan on establishing new goals to continue to strive to meet and stay motivated. Read all incredible results in all twenty testimonials from Bar Method Redmond. Find a Bar Method exercise studio near you.